"Hardly. History is real, and is going on, all around us, all the time—you can’t get away from it! And, like it or not, you are "making history" by merely existing. Several generations from now, an eager genealogist will be taking great pleasure in attempting to document the name of both you and your children, and the events that shaped your lives." The Society continues to acquire valuable historical artifacts which now number approximately 1000 items. The Society's collections are housed in the Historical Society building. Each of the collections is a part of Nobleboro history, yet the exhibits have wide appeal to people who live anywhere in the country or world. Items are organized and categorized by our curators and dedicated volunteers. Most of our donations are from families who lived or continue to live in this area. Many of these families represent original settlers and homesteaders. George Weston has donated 50 of his wonderful Nobleboro photo albums to the Society. This is a most remarkable collection as not only are there many wonderful old Nobleboro photos, but George has taken photos of Nobleboro happenings as they occurred over the years. In addition, the photos are clearly labeled with extensive information related to the photo’s content. It is truly a one-of-a-kind, outstanding collection and the Society will be pleased and appreciative to have it when George no longer needs it. Below is a link to the list of the society's collections that may be of special interest. Please click on the item for more information. For books and town/governmental records please refer to our Ancestors/Genealogy page. You may contact us to assist you and we will respond as quickly as possible. The Historical Center is open on Saturday afternoons during July and August from 1:30 to 4:30 or any time by appointment. A volunteer will be available to answer your questions. 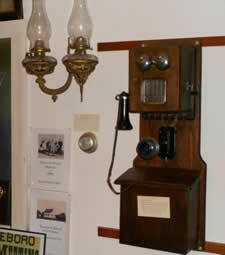 There is information about Nobleboro history and many of the historic artifacts on display. The Center can be enjoyed by all ages – and it’s free. Maps, books and memorabilia are available to buy.